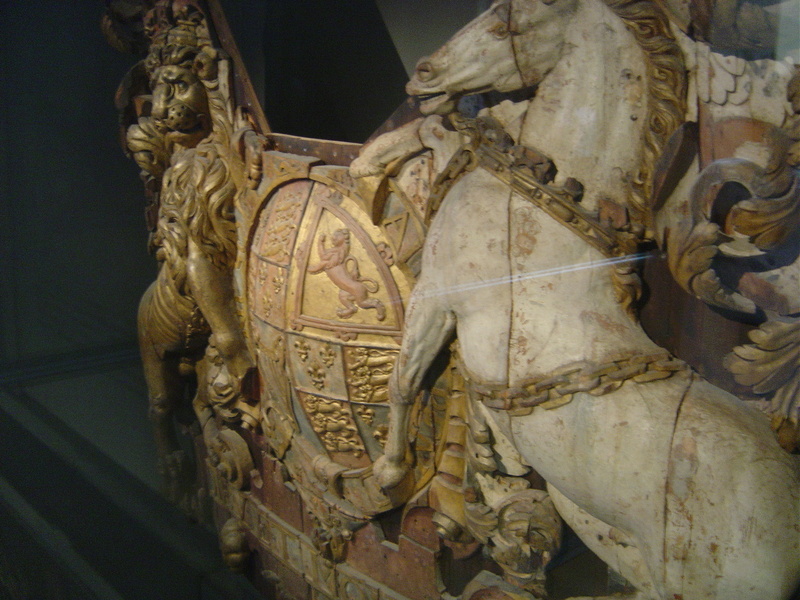 Last week I was speaking to Dutch TV about a documentary they’re planning on the Anglo-Dutch wars, and during the course of that it emerged that the sternpiece of the Royal Charles, captured at Chatham in 1667 and a prominent exhibit at the Rijksmuseum, will be returning temporarily to the UK for an exhibition at the National Maritime Museum, Greenwich. This is fantastic news; I’ve seen the sternpiece in Amsterdam several times (here are a couple my pictures of it, taken in the days when I didn’t have a particularly decent camera! ), but to have it back home, even if only briefly, will be quite something. At about 10 a.m. on the morning of Wednesday 12 June 1667, a squadron of Dutch warships sailed up Gillingham Reach on the River Medway. Ahead of them lay a large chain, stretched taut across the river, blocking their way to the British warships that lay beyond, off the great naval dockyard at Chatham. Most of the British ships were dismasted and virtually unarmed. Lacking the money to send a proper fleet to sea for that summer’s campaign (and believing in any case that peace was imminent), King Charles II had ordered the ships to be laid up, trusting that the chain and the forts guarding the Medway would be sufficient to protect the navy against just such a Dutch attack. But most of the forts were still incomplete, and the largest and most important of them, that at Sheerness, had already fallen to the Dutch two days earlier. Still, the great chain appeared to be an insuperable obstacle, and so it might have proved but for the audacity of Jan Van Brakel, a Rotterdam captain, who volunteered to lead his ship, the Vrede, in an attack on the barrier. Under heavy fire, he attacked the guardship Unity, which protected the chain, and thanks to a supine defence by her inadequate crew, he took her without a serious fight. This allowed the fireship Pro Patria to sail directly at the chain, which broke on impact (according to the Dutch) or else sank under its own weight (according to the English). Beyond one last and easily negotiated barrier of undermanned guardships lay the most seaward of Charles II’s great ships, the Royal Charles. Only 32 of her 82 guns were still aboard, and she had virtually no crew embarked. The men ordered in haste to tow her to safety up river simply turned and fled when they saw that they were too few, and too weakly armed, to resist the approaching Dutch. A small prize crew quickly took possession of the ship, striking her British colours and replacing them with the tricolour of the United Provinces of the Netherlands. The Royal Charles was taken back to the Netherlands and laid up at Hellevoitsluis; she had too great a draught to serve in the Dutch navy. In 1673 an operation to rescue her seems to have been contemplated, with the Earl of Ossory appointed to command it, but Charles II allegedly countermanded the order the night before Ossory was due to set out. In any case the Dutch had no further use for their prize and she was broken up that year, only the sternpiece being retained. In Britain…the Dutch wars are usually regarded as an embarrassing epoch of naval mediocrity, sandwiched between the more memorable (and successful) eras of Drake and Nelson. The names of the Dutch navy’s largest warships are and always have been redolent of the seventeenth century: De Ruyter, Tromp, De Zeven Provincien. Conversely, the Royal Navy has had no warship named after a battle of the age since the destroyer Solebay was broken up in 1967, none after a seaman since the frigate Russell went to the scrapyard in 1985. There has not even been a HMS Blake since the cruiser of that name was scrapped in 1982, and there has never been a HMS Pepys. The ever diminishing size of the fleet, and rampant ‘political correctness’ in the naming of British warships, means that such illustrious names are unlikely ever to go to sea again under the white ensign. 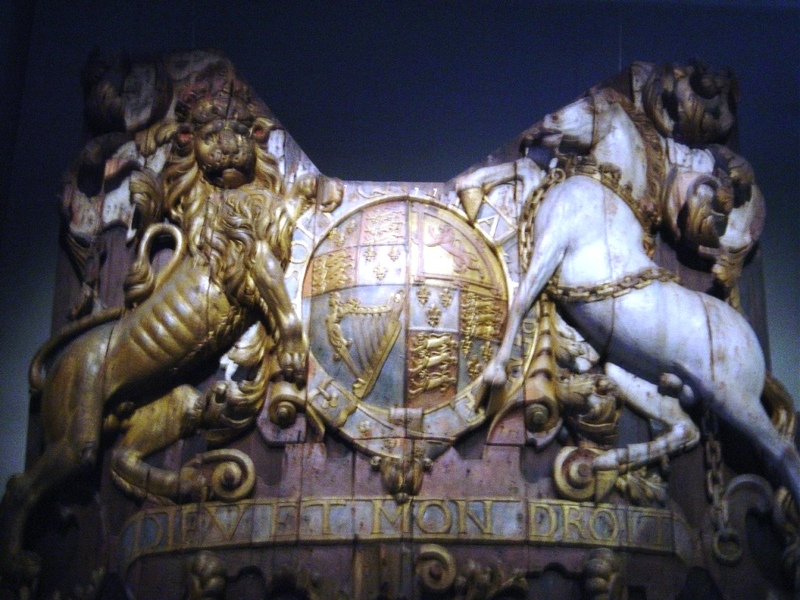 Moreover, the largest surviving relic of a British warship captured by the Dutch, the sternpiece of the Royal Charles, is a prized exhibit at the Rijksmuseum in Amsterdam. 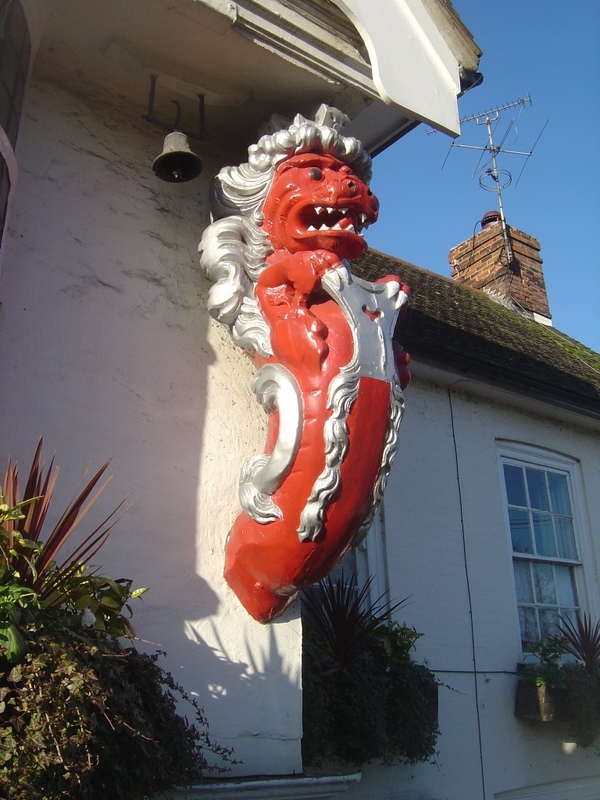 What has often been suggested as the largest surviving relic of a Dutch warship captured by the British, supposedly the figurehead of the 50-gun Stavoren, captured in 1672, adorns the side wall of a pub in Suffolk. This question of how different nations always see the past through prisms, exaggerating their triumphs and diminishing their defeats – just as individual human beings do – was thrown into focus recently by the wonderful story that France has plans for a ‘Napoleonland’ theme park. (See M M Bennetts’ hilarious take on it all – blog post of 7 February.) Amidst all the inevitable scoffing from we rosbifs, though, there might be some food for thought. At least Napoleonland will have the good grace to give a prominent profile to both Trafalgar and Waterloo, and the French do have some ‘form’ in being prepared to own up to their own reverses. (Of course, cynics might say that they have plenty to own up to.) It is difficult to imagine an English ‘Hundred Years War’ theme park giving similar prominence to the Battle of Castillon, 1453, a defeat as decisively terminal in that war as Waterloo was for Napoleon. But the French have even created a small museum at Agincourt, or Azincourt to give it its proper name, manned – when I was there last – by a justifiably grumpy and somewhat embarrassed middle-aged Frenchwoman; French magnanimity only went so far, though, as she spoke virtually no English despite the fact that almost all of her visitors had ‘GB’ plates on their cars. 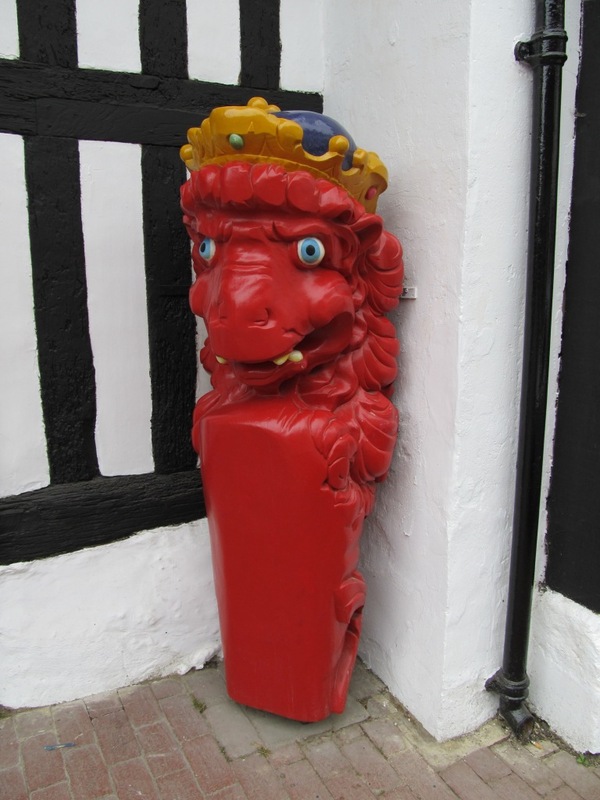 So let’s magnanimously welcome back the Royal Charles sternpiece, at once an embarrassing reminder of a catastrophic British defeat and the finest surviving relic of the Anglo-Dutch wars. I, for one, am delighted that its presence here ought to give a welcome boost to the public profile of the Anglo-Dutch wars, hopefully leading to enhanced public awareness and understanding as a result. Good and nice article to read. Very nutral, which is very pleasant. It makes me curious what you write about e.g. Waterloo and the duke of Wellington. I know to different stories. The English version is that Wellington saved the day all by himself. And the Dutch version is that the Dutch half of the joined Anglo-Dutch forces had to take innitiative and safe the Anglo forces from defeat against Napoleon, taking over command from the English (Wellington even fled from the scene) and prevent a defeat before the Prussians and Russians arrived on the scene. The Dutch-Anglo joined forces were only strong enough to stall Napoleon long enough so that the other allied forces had time to reach the battlefield to give the final punch. Just curious if you have written anything about that….. I bet that the real story is somewere in the middle. Thanks for your outstanding article! Thanks for your positive comments Kaj! No, I’ve never written about Waterloo, although I have visited the battlefield and have a strong interest in the British generals Lord Uxbridge and Sir Thomas Picton. But I suspect you’re right, namely that the truth lies somewhere in the middle. Thanks Gijs! Good to hear from you. I’ll get in touch properly in the near future!